This recipe I made long back and kept the photos available. But could not post it then itself. As I am slowly recovering from my illness, Low Blood Pressure, trying to post all the previously made recipes. Even before attempting new recipe let me clear all my old recipes. So I post very simple and easy recipe for now. A very simple curry which can be served with rice or roti. I prefer it with rice only. Wash and cut green capsicum into cubes. Add turmeric powder and cover it. Do not add salt now. Once capsicum cooks then only we can add salt. If we add salt in the beginning itself,curry oozes excess water. 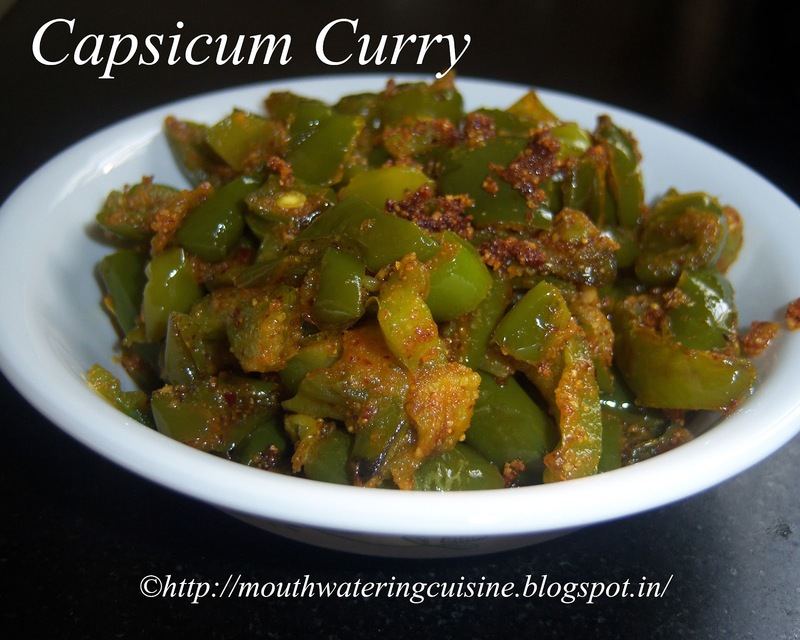 Once capsicum cooked completely add curry masala powder and stir well. serve this simple capsicum curry with rice.